The V5013N is a three-way threaded globe valve that controls hot water, cold water, and glycol solutions (up to 50 percent concentration), in heating or cooling HVAC applications. 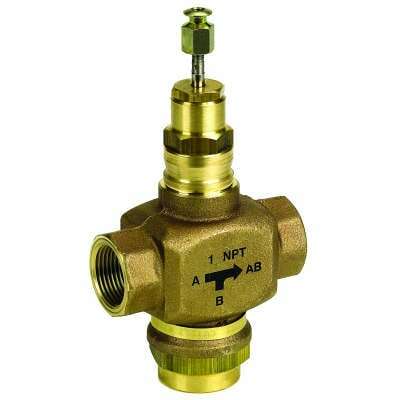 The valves direct flow from one or two inlets to a common outlet. Red brass body with NPT-threaded connections. Stainless steel stem and brass plug. Low seat leakage rating, < 0.05%. 50:1 rangeability per VDI/VDE 2173. Constant total flow throughout full stem travel. Accurate positioning to ensure state-of-the-art temperature control. Sizes range from 1/2 inch to 2 inches. Valves utilize direct mounting, electric or pneumatic valve actuators; Q5001 linkage with Modutrol Motor; or Q5020/Q5022 linkages with Direct Coupled Actuators to operate the valve. Repack and rebuild kits available for field servicing. Chilled or hot water with up to 50% Glycol. Not for use with fuels.